After a gap of nearly a century, the pilgrimage to the Harmukh-Gangbal shrine situated at an altitude of 12000 feet is all set to begin from Srinagar on Monday. A batch of over 40 Kashmiri pandits on Sunday left for the yatra to the sacred lake in Kangan belt. Gangbal is situated in the hills of Harmukh range in north east of Kashmir valley, at a height of 12000 feet on the Ganderbal-Sonamarg road. Gangbal is also called Harmukut Ganga and is believed that this place is pious as Haridwar where pilgrims perform prayers and immerse ashes of the dead. The last village Wusan is about 20 kms from Srinagar. Ramradhan is the first pilgrimage centre about 5 kms from Wusan. Then the journey begins to Yamhear which is about 6-kms away. It is a steep ladder-like path and perhaps that is why it is called Yamhear (Lord Yama's ladder). The route is dotted with several other lakes and temples. There is the black water lake known as Bramsaar, Sukhnag, a hot water lake, and Dukhnag where pilgrims take holy dip. The return journey is from a different route via Narannag on the banks of a rivulet called Krenk nadi where beautiful temples are located. Larakota* king Laltaditya Muktapida had expanded and beautified the Jyestha and Bhutesha temples at Narannag. An annual festival will also take place at Gangbal on the occasion of Ganga ashtami, a spokesman said. * That should be Karkota dynasty (8th century AD). "About forty miles from Srinagar, and lying at the foot of the great peak Haramokh, is the remarkable Gangabal Lake. It is reached by a steep pull of 4000 feet from the Sind valley. By the side of the path rushes a clear, ice - cold stream. From the top of the rise are superb views precipitously down to the Wangat valley leading up from the Sind and beyond it to a jagged range of spires and pinnacles. The path then leads over rolling downs, covered in summer with ranunculus and primulas, to a chain of torquoise and ice-green lakes, above which grimly towers the massive Haramokh six thousand feet above the water, and giving birth to voluminous glistening glaciers which roll down to the water's edge. It is a silent, solitary, and impressive spot, and is held in some reverence by the Hindus." A lot more about the belief of Kashmiri Pandits with regard to Gangbal Lake can be found in the marvelous book called "The Valley of Kashmir" (1895) written by Walter Rooper Lawrence. "Gang Ashtmi, the eighth day of the waxing moon of Bhadron. is the day when Hindus take the bones [astarak) of their dead to the lake beneath Haramukh and perform the sharadli service for the departed. Bhadron/Bhadon usually means somewhere between August-September. "To Ganga-Bal the Hindus resort after the death of a parent, and fling the knuckle-bones which the funeral pyre has spared into the deep waters. The road is difficult, as early snow sometimes overtakes the pilgrims, and delicate women and children often perish from exposure." "It is universally said that no poisonous snakes exist in parts of the valley from which the peak of Haramak can be seen." It was believed so - universally - in Kashmir. Burn the veil, today, on pain of fire, Turn to Harmukh and See"
- a line from a song by Shamas-Faqir (1843 - 1906), a Kashmiri Sufi poet whose actual name was Mohammad Siddiq Bhatt. 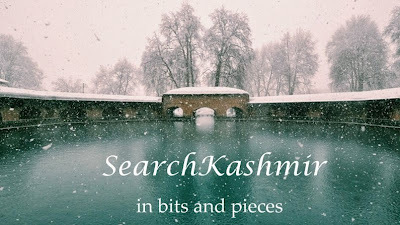 Why do stories connected with various Shiva pilgrimage sites in Kashmir (even Jammu) almost always have gujjars in them? Gangbal - Harmukh has a tale known as Hurmukh'uuk Gosoni or 'Saint of Harmukh'. A Sadhu, for twelve long years, and in vain, to have the darshan of Lord Shiva, tried to reach the summit of the Harmukh. Then one day he saw a gujjar coming down the summit and as the gujjar got near him, the Sadhu asked him what all did he saw up there. The gujjar told him that up-there somewhere his goat strayed , got lost (they always do) and while searching for it, up there, he saw, a man and a woman, a couple milking a cow and drinking that milk in a human skull. The kindly couple offered some milk to him too, which he of course refused to drink, but then when as couple were leaving, while departing, they rubbed some of that milk on his forehead. While the gujjar was concluding his account of the strange meeting, as his last gesture, with his forefinger, he pointed out the spot on his forehead where the couple had applied milk. Just then, the Sadhu, in a flash, eagerly and in mad joy, started to lick the gujjar's forehead and with each lick Sadhu's body, starting toe first, began to disappear - like someone running an eraser over it. According to the tale of Hurmukh'uuk Gosoni or 'Saint of Harmukh', the Sadhu, that hermit, got instant Nirvana and disappeared from the face of this earth and the gujjar was left rubbing his forehead in utter surprise and in some warm pain. Wish cameras and camera phones were as common back then :-( Those have been memories to cherish till death. A minor correction. The name Bhuteshwar is mentioned in Nilmat but not as a mountain but as a Tirth. The Bhuteshwar Teerth associated with Harmukh/Gangbal is the Bhuteshwar temple of Wangat near Naran Naag...from where the trek to the lake now usually starts. This Bhuteshwar Mountain = Butsar Mountain is new invention. The founder of that great school was quite keen on making a man out of lazy Kashmiri men. I was in Biscoe too, but I wasn't old enough to go on these wonderful trekking trips. Hami Asto Hami Asto Hami Ast. going there in coming September,13. Let's see what i get..